Mexico’s Southern Border Plan (Programa Frontera Sur) was announced on July 7, 2014. Its stated objective is to bring order to migration in Mexico’s southern region while protecting the human rights of migrants who enter and travel through the country. The plan has coincided with a sharp increase in deportations from Mexico: according to the Secretary of the Interior (Secretaría de Gobernación, SEGOB), Mexico deported 107,814 migrants in 2014, the vast majority of which were from Central America. That is a 35 percent increase from 2013, when authorities deported 80,079 migrants. The increase in Mexico’s deportation of children is even more striking: the 18,169 children that Mexico deported in 2014 represents a 117 percent increase from 2013, when that number was 8,350. Increased enforcement in Mexico, along with enhanced border security efforts in Central America and an aggressive public relations campaign to dissuade Central American migrants from making the journey north, seems to have contributed to a decrease in the number of migrant children and family units reaching the United States. Border Patrol’s apprehensions of “Unaccompanied Alien Children” at the southwest border fell sharply, from 10,631 in June 2014 to 2,432 in September 2014. Border Patrol reports that between October 2014 and February 2015 apprehensions of unaccompanied migrant children have decreased 42 percent as compared to the same time period the previous year. Thus, Mexico’s enforcement operations may have at least partially deterred migrants in the near term. Mexico’s efforts have certainly been greeted with applause in Washington, most recently by President Obama, who, after meeting with President Peña Nieto on January 6, 2015, praised “Mexico’s efforts in addressing the unaccompanied children who we saw spiking during the summer,” and credited those efforts with contributing to the reduction in child migration at the U.S. border. But migration levels often vary with the seasons. As the spring and summer approaches, we may again see a marked increase in the number of Central American migrants arriving at the U.S. border with Mexico. In a post on WOLA’s Border Fact Check, Adam Isacson projected that if current trends continue, more migrants will arrive in 2015 than in any previous year except 2014. And while authorities have largely kept migrants off the train in southern Mexico, migrants and smugglers are already finding new routes to evade the profusion of checkpoints and raids along Mexico’s southern border. Migrants are taking informal third-class buses called “Tijuaneros” (because they follow a route from Chiapas to Tijuana), or traveling by sea along the coast of Chiapas and Oaxaca. 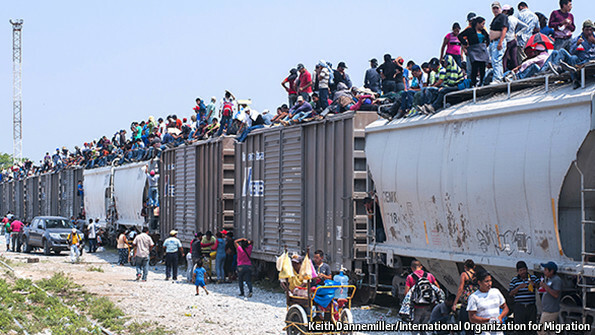 Some migrants continue to ride the train in southern Mexico, at great personal risk. WOLA recently received information from a shelter in Tabasco about a migrant who jumped off the train during a raid and drowned in a river as immigration agents watched. Other migrants simply walk through rural areas, where in recent months they have been robbed by ranchers. Overall, migrants are now less visible, and are often far from the primarily church-run shelters that have grown up along the train route. Without the protection and support from the courageous priests, nuns, and lay persons who run these shelters and denounce criminals and corrupt officials that prey on migrants, Central Americans crossing Mexico are more vulnerable than ever. WOLA continues to receive reports from shelter workers of abuse by officials, including concerns that enforcement operations are taking place with little regard for due process, that soldiers are participating in the operations, and that agents have used violence to detain migrants. Mexico has done little to address the concerns raised by WOLA and other human rights organizations when the Programa Frontera Sur was first announced. Reports continue to emerge about corruption within the National Institute for Migration (Instituto Nacional de Migración, INM); on January 31, 2015, a newspaper from the State of Veracruz published a story about an INM agent who allowed a migrant to escape from detention in exchange for a bribe of approximately US$2,680. Nor has Mexico increased its protection capacities in a manner commensurate with its border buildup; the budget of the Mexican Commission for Refugee Assistance (Comisión Mexicana de Ayuda a Refugiados, COMAR) only increased by 4 percent between 2014 (approximately US$1.66 million) and 2015 (approximately US$1.73 million). Meanwhile, asylum seekers face a difficult road to refugee status: only 16 percent of asylum requests in 2014 were approved. The Transborder Migration and Gender Coalition (Mesa Transfronteriza Migraciones y Género) recently documented a case of Honduran and Salvadoran asylum seekers who were detained for months while they waited for a resolution for their case, and at least thirteen of them were subject to mistreatment, including physical and verbal abuse, by INM agents while in detention. To address these immigration enforcement concerns, Mexico needs to take concrete steps to confront the widespread problems of corruption and abuse in the INM and other agencies responsible for immigration enforcement and border security; the United States should prioritize such efforts in its cooperation with Mexico. Additionally, Mexico needs to strengthen and invest in its protection system, expanding the presence of COMAR, increasing training for INM agents on identification of asylum seekers and trafficking victims, and ensuring effective access to legal representation for asylum seekers. The United States should invest in strengthening protection capacity in Mexico. CORRECTION: This post was updated on April 3, 2015 to correct a statistical error. The percent increase in deportations of children from Mexico between 2013 and 2014 was 117 percent, not 54 percent. The Obama Administration paid Mexico to deport Central Americans before they reach the U.S.
Cut off ALL freebies, make them self deport. No school, no healthcare, no job, no housing, no bank accounts, no drivers license, no welfare, no food stamps! So Trump's plan that we thought was new is not new at all. It's just another failed Obama policy. Beezer, stoptheinvaders and JohnDoe2 like this. The "new" was using aid money to pay for it. In 2017 Mexico invested $50 million (money issued to consulats) to provide free legal aid to Mexican illegal aliens fighting deportation from the united States. So we give Mexico $20 million to deport Central American illegals while Mexico turns around and invests $50 million to help keep their citizens illegally in the United States. Oh, and Mexico was also paying DACA enrollment fees for their citizens. Therefore, I guess Mexico is fine helping to deport Central American illegals as long as we're paying for it, but their reasoning probably has nothing to do with being good neighbors. They just don't want illegal aliens from other countries messing up the good thing they got going with their citizens living illegally in the U.S. They need us as their valve to bleed off their impoverished and poorly educated citizens and the remittances those folks send back to Mexico. It all seems to be a win-win for Mexico. Anyway you look at it, this crap is just crazy! Mexico earns hundreds of billions of dollars a year off illegal immigration into the US through drug money, smuggling money, remittances, other criminal enterprises, tax credit welfare and other public benefits. Illegal immigration into the US is big money for Mexico.